Due to the amount of NanoFate that have been floating around in my mind, I finally got around around to translating and posting this. That’s not the reason I’m posting this though. This is actually from quite a while back, in fact, almost a year ago. But as far as I know, the video itself was only uploaded onto the internet about 2 or 3 weeks ago. Anyway, we all know that Nana-san is a big NanoFate supporter, right? And we also know that Yukarin occasionally makes NanoFate comments as well? I personally really liked how Tomokazu Sugita described this performance. 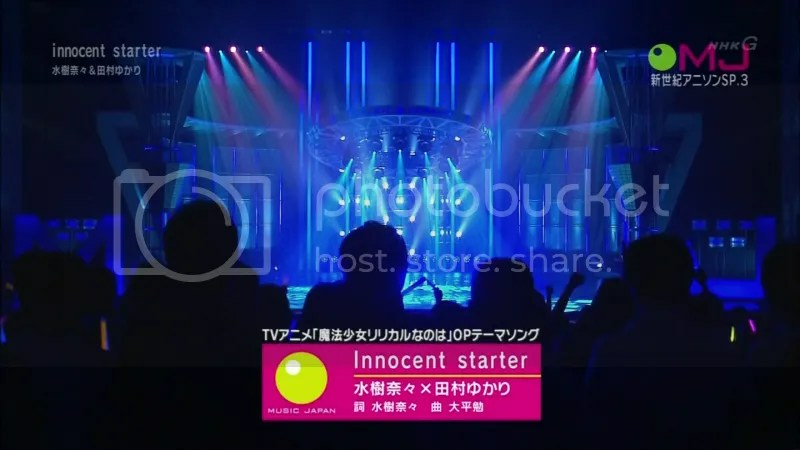 There is something about seeing the names 水樹奈々 and 田村ゆかり under the words “Innocent starter” that makes me grin uncontrollably. Most likely due to the fact that fans (especially Nanoha fans) have been waiting far too long to hear the two sing these songs.